talented individuals who lead us in music. As the leader of the house trio at the Mansion On Turtle Creek in Dallas for five years, she sang and played piano for Don Henley, Rod Stewart, Steve Winwood, Paul McCartney, Quincy Jones, Billy Joel, Sidney Portier, Robert Goulet, Patti LaBelle, and others. She has performed at special events. wineries, and exclusive night spots throughout the United States. 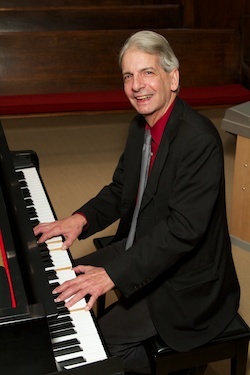 Unity Church on Greenville is blessed to have Tommy DeSalvo as our pianist. Trained at our own University of North Texas Music School, can be seen performing weekly, as he is the resident pianist at Nick & Sam's where requests are his specialty. "If they can say it, I'll play it." (He was also the staff organist for the Texas Ranger's when they used a live organ instead of pre-recorded music). Called into being, we listen. Living resonances of the word, we sing. Together in endless song, is harmony.